Sure, we all know about barefoot running, but we also know it comes with a lot of warnings. You should carefully build up to running barefoot, and obviously you need to look before you put your foot down! I haven't really dared to subject my bare feet to the rough exterior of mother earth. Occasionally I walked a few steps barefooted, because my shoes were killing me, but otherwise I go through life wearing shoes. Because it's easier, and less risky. However, I most certainly do appreciate the freedom that comes from running barefoot! So I'm happy to announce the next best thing to barefoot running: barefoot biking! I discovered it quite by accident, last week. 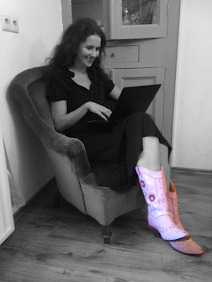 I was wearing my cute cowboy boots, but it turned out to be a much warmer day than I had anticipated. Oh how I longed for my Birkenstocks! Finally when I actually thought I saw steam coming out of my boots, I decided: I'll just take them off, and will proceed barefooted. I am barefooted, see me ride my bike! And it felt lovely! I felt all free and unencumbered. Sure the pedals were a bit rough beneath my feet, but at least I was safe from nasty shards and stuff. So I can greatly recommend barefoot biking, for those who love the feeling of barefoot running but are afraid to get hurt. Look, this is me doing the barefoot biking thing! LOL! 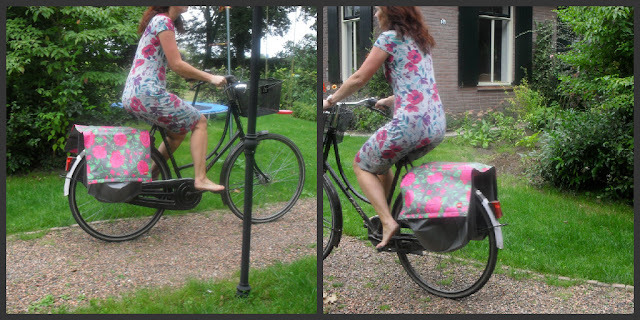 I actually did a video on my blog about barefoot biking :) I like your dress! I'm going to have to watch that video! Thanks for the compliment on the dress. I love anything floral, as you can see. I love it! We around here are perpetually barefoot--my daughter has a particular bike she likes to ride b/c it is more comfortable for her bare feet than the other. Way to go! I love going barefoot where I can. I'll often work barefoot during summer because it gets so hot. I'm not surprised that you found barefoot cycling fun. Something about that looks so liberating! I have clips on my pedals for my biking shoes so I can't actually bike barefoot. But I've been wanting to get a cruiser bike for just riding around the neighborhood -- now I have another excuse why I "need" it!! Yes you do! Just picture yourself cruising through your neighborhood!